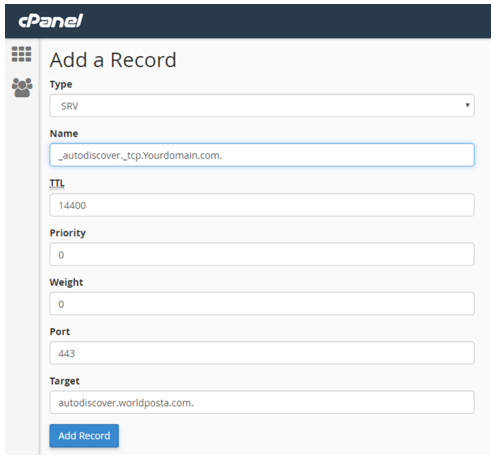 1- Login to your cPanel account. 2- Click on Advanced Zone Editor (or MX Entry) in the Domains section. 3- Select the domain you want to edit from Domain dropdown menu. 4- In Email Routing section, select Remote Mail Exchange. (If it already selected click Change). IMPORTANT: delete any existing entries. 5- Add the following MX records; click on Add New Record after each entry. 2- Select the domain you want to edit from the dropdown menu. 3- Choose TXT from Type dropdown menu. 4- Add new record and choose SRV from Type dropdown menu.